Age - this is considered to be the largest risk factor. When a man is over 45 years, and the woman is over 55 years of age, their risk of having a heart attack starts to rise significantly. Scientists from the University of Copenhagen, Denmark, found that the visible physical signs of aging, such as the accumulation of fatty deposits on the eyelids and baldness are associated with a higher risk of developing heart disease and having a heart attack. Senior researcher, Anne Tybjaerg-Hansen, said "The visible signs of aging reflect physiologic or biological age, not chronological age, and are independent of chronological age." The researchers found that a receding hairline, baldness, earlobe crease and xanthelasmata (fatty deposits around the eyelids) increased heart attack risk by 57% and ischemic heart disease by 39%. They presented their findings at the American Heart Association's Scientific Sessions 2012 in Los Angeles. Angina - angina is an illness where not enough oxygen is reaching the patient's heart. This raises the risk of a heart attack. In some cases a diagnosis of angina was wrong - it could have been a mild heart attack instead. The main difference between a heart attack and angina is that the patient with angina will feel better about 15 to 30 minutes after taking medication, while the heart attack patient won't. Blood cholesterol levels - if a person's blood cholesterol levels are high, he/she runs a higher risk of developing blood clots in the arteries. Blood clots can block the supply of blood to the heart muscle, causing a heart attack. Diabetes - people with diabetes have a higher risk of developing several diseases and conditions, many of them contribute to a higher risk of heart attack. Diet - a person who consumes large quantities of, for example, animal fats, or saturated fats, will eventually have a higher risk of having a heart attack. Genes - you can inherit a higher risk of heart attack from your parents, and/or their parents. 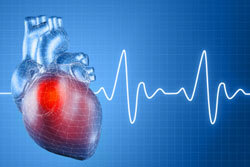 Heart surgery - patients who have had heart surgery have a higher risk of having a heart attack. Hypertension (high blood pressure) - this could be due to lack of physical activity, overweight/obesity, diabetes, genes, and some other factors. Obesity, overweight - as more and more people are overweight, especially children, experts believe heart attacks will become more common in future (if the overweight children become overweight adults). Physical inactivity - people who do not exercise have a much higher risk of having a heart attack, compared to people who exercise regularly. Previous heart attack - anybody who has already had a heart attack is more likely to have another one, compared to other people. Smoking - people who smoke heavily or regularly run a much higher risk of heart attack, compared to people who never smoked and those who gave up. Smoking regularly means smoking every day. Whilst a heart attack can often be sudden and unannounced, most other times, the condition develops over a period of time. You can read the warning signs and take the necessary precautions if you pay heed. The most common warning sign of a heart attack is the feeling of discomfort or heaviness in the chest. This feeling could also be more of a burning sensation. Any of these symptoms should not be taken lightly, and if it occurs more than once, you need to rush to your doctor. If another person is complaining of the problem, chances are they have experienced the feeling before and are only expressing it now. So, rush them to the nearest doctor or hospital immediately for a check up. Whilst sweating is inevitable in the scorching heat of May and June, excessive sweating even in cool conditions is uncalled for. If you notice such sweating, consult a medical professional immediately. A heart attack can be avoided if the warning signs are read correctly and in time. Seek medical aid immediately if one or more of the above symptoms are noticed. They could be the result of a choked artery. Even if heart attack is not the result, a check up should definitely not be avoided! Take care!